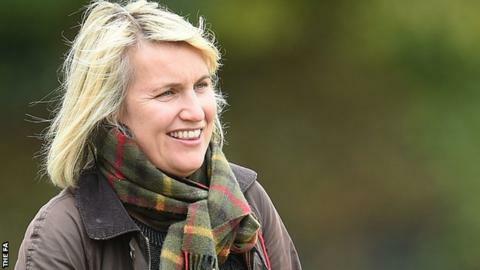 Chelsea Ladies boss Emma Hayes says her top-of-the-league side have "learnt their lessons from the past". The Blues have won all three of their league games so far in 2015 and lead Women's Super League One by two points. Speaking after Sunday's 1-0 win over defending champions Liverpool, Hayes told BBC Radio 5 Live Sports Extra: "I can't ask for any more from my team. "Last year, I'm pretty certain we would have been 1-0 down at half-time in that game. They're tougher, more resilient." After three league games, they have currently scored more goals (7) than Manchester City, Notts County, Birmingham City and Bristol Academy combined (5). Hayes also praised in-form left-sided player Claire Rafferty, who is back in the first team after suffering an anterior cruciate ligament knee injury in 2013. "Claire Rafferty in particular was tremendous (against Liverpool)," Hayes added. "For someone who has been out with the injuries that she's had, I'm very happy for her. "We played without our captain (Katie Chapman) and to still win at home against the top team in the country, just shows our strength in depth. "There was already a good spirit here, it's just adding the right experience, quality pieces that will take us to the next level." Chelsea continue their league campaign away to Birmingham City on Sunday.